The Club Desire, which stood across the street from this site, was one of Mississippi's premier blues and rhythm & blues nightclubs from the late 1940s through the early 1960s. Owner Clarence Chinn presented the top national acts, including B. B. King, Bobby Blue Bland, Little Junior Parker, James Brown, Ivory Joe Hunter, Big Joe Turner, Hank Ballard & the Midnighters, and the Platters. In the '60s the club also served as an important meeting place for civil rights workers. Club Desire - or New Club Desire, as it was actually named for most its tenure - was a Canton landmark for several decades, renowned for providing the African American community with first-class entertainment in a celebratory but elegant atmosphere, with strict codes enforced for dress and behavior. Its shows drew patrons from Memphis and New Orleans, and former Cantonites from Chicago and points beyond often attended family reunions and gala holiday events here. Founded by Clarence Chinn (1906-1995) in the 1940s as the Blue Garden, the club was rebuilt after a fire and renamed New Club Desire in the early '50s. 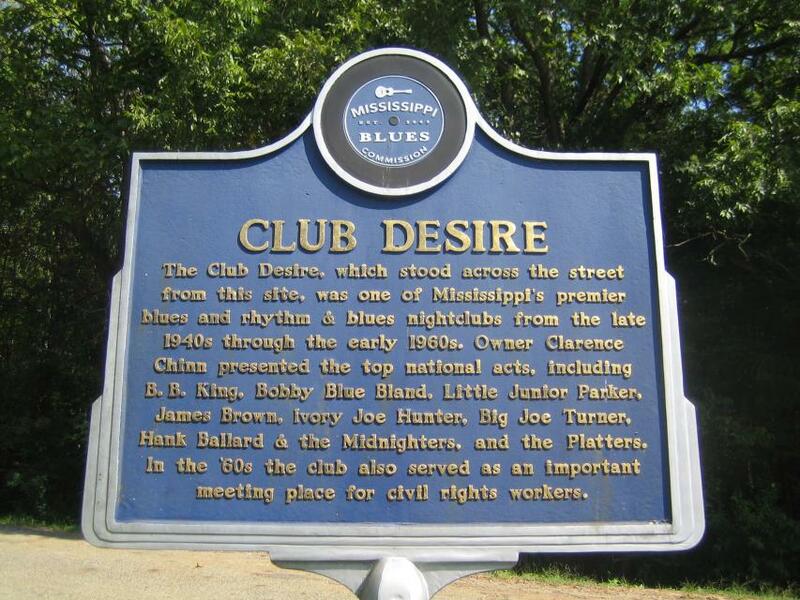 The name Club Desire was first used by a popular nightspot on Desire Street in New Orleans. The club also earned a place in blues recording history in January 1952 when Modern Records of California rented it to set up a portable tape machine to record several songs by legendary Canton singer-guitarist Elmore James (1918-1963). Modern's talent scout, Ike Turner from Clarksdale, played piano on the session. Two local members of James's band, Ernest "Frock" Odell and Precious "Little Hat" Whitehead, were probably also on the recordings. Most published accounts of this session have erroneously cited the name as the Club Bizarre. 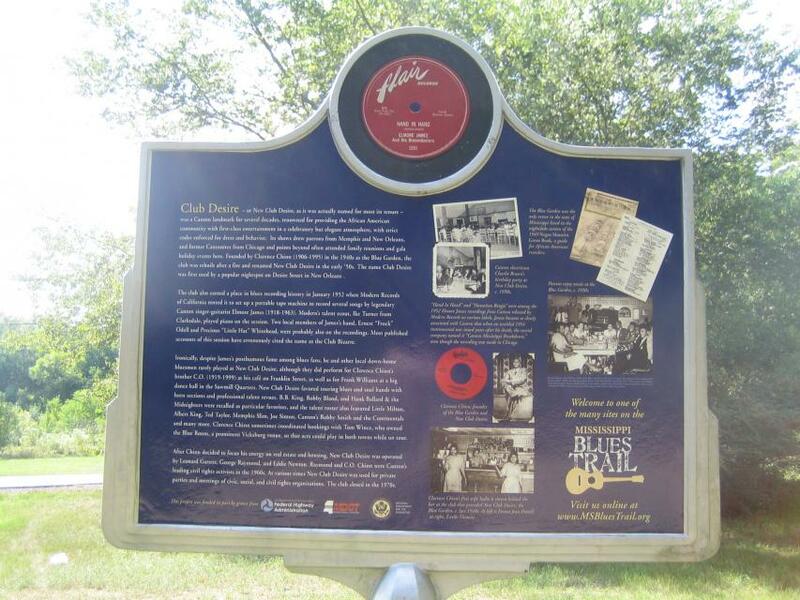 Ironically, despite James's posthumous fame among blues fans, he and other local down-home bluesmen rarely played at New Club Desire, although they did perform for Clarence Chinn's brother C.O. (1919-1999) at his café on Franklin Street, as well as for Frank Williams at a big dance hall in the Sawmill Quarters. New Club Desire favored touring blues and soul bands with horn sections and professional talent revues. B.B. King, Bobby Bland, and Hank Ballard & the Midnighters were recalled as particular favorites, and the talent roster also featured Little Milton, Albert King, Ted Taylor, Memphis Slim, Joe Simon, and many more. Clarence Chinn sometimes coordinated bookings with Tom Wince, who owned the Blue Room, a prominent Vicksburg venue, so that acts could play in both towns while on tour. After Chinn decided to focus his energy on real estate and housing, New Club Desire was operated by Leonard Garrett, George Raymond, and Eddie Newton. Raymond and C.O. Chinn were Canton's leading civil rights activists in the 1960s. At various times New Club Desire was used for private parties and meetings of civic, social, and civil rights organizations. The club closed in the 1970s. This marker can also be identified by its HM code. You can use the hashtag #HM1INH in tweets, and any other place where you might refer to this marker, including when searching on this site.